The Builder enables you to set and update application properties and to add and edit its modules, views, and data providers. All Name fields are restrictive. If the symbols you placed in them are not supported, the Builder displays the Invalid format. Only letters, numbers, "_" and "-" are allowed. error message. 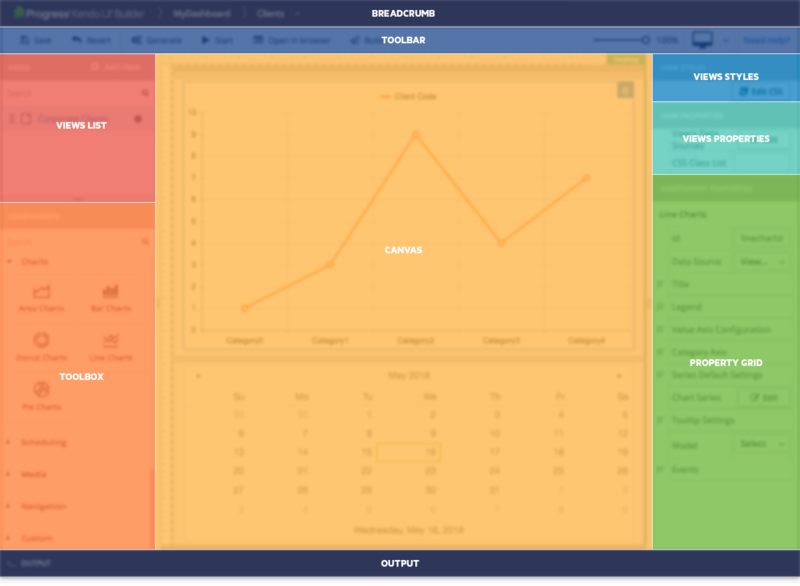 The Dashboard provides options for creating or deleting an application, editing its properties, and defining user roles. For more information on handling the application state, managing options, and migration, refer to the articles on managing the application. For more information on setting access rights and defining user roles, refer to the articles on authentication and authorization. On the Dashboard, select the Create App option to open the Create App dialog box. 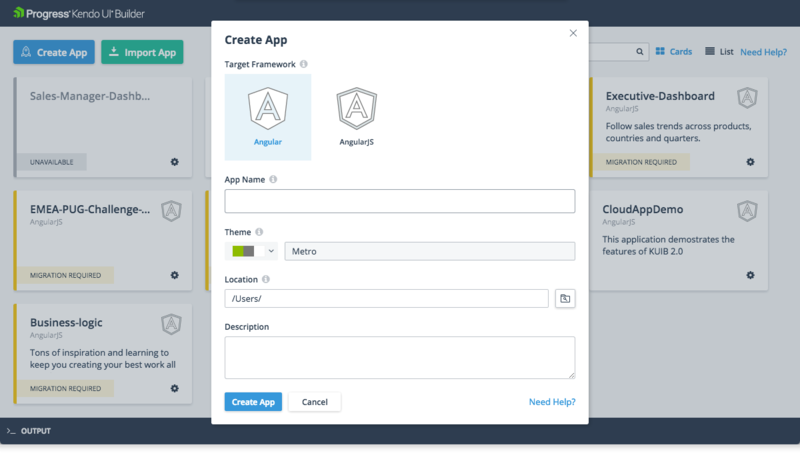 In Create App > Target Framework, select the framework by clicking on the option. In Name, provide the name of the project. (Optional) In Theme, select the theme from the drop-down options list. (Optional) In Location, set the location. (Optional) In Description, provide a short description of the project. Click Save to save the application properties and close the Create App dialog box. As a result, the Dashboard displays the card (or list item) for your new project with the properties you defined. In Edit App, update the properties you want. On the Dashboard, go to the card (or list item) of the application. Click the Settings icon to open the drop-down options list. Select Roles to open the Authorization Roles dialog box. In Roles, define a user role. Click Add Role to add the user role to the list below. On the Dashboard, select the Import App option to open the dialog box for selecting the location. Select the location of the project you want to import. Click Select Folder to confirm the import of the application. As a result, the Dashboard displays the card (or list item) for your imported project. The Builder provides each new project with a default Application Module (App Module). For more information on modules types and the App Module features, refer to the articles on modules. On the App Design page, click Add Module. As a result, the Add Module dialog box appears. In Name, provide the name of the module. (Optional) Click the Icon/Color icon to add an icon to the module and to select a color for the icon and the background. Click Apply to save or Cancel to discard your changes. (Optional) In Label, define the name of the module as it will appear in the menu and on the landing page of the generated application. (Optional) In Description, provide a short description of the module as it will appear as a tooltip on the landing page of the generated application. (Optional) Click Roles to define the access rights for this view. For more information, refer to the article on authorization and roles. Click Add Module to save the module properties and close the Add Module dialog box. As a result, the App Design page displays the card for your new module with the properties you defined. On the App Design page, go to the card of the module whose properties you want to update. Click the Settings menu to open the drop-down options list. Select Properties to open the Edit Module dialog box. In Edit Module, update the properties you want. On the App Design page, go to the card of the module you want to delete. The order of the modules on the App Design page corresponds to the order in which they will be rendered by the application at runtime. To reorder the modules, drag and drop them within the list. The Builder provides options to add views, edit their properties, reorder, and delete them. For more information on view types and features, refer to the articles on the views. Go to the card of the created module and click on it. Click Add View. As a result, the Add View dialog box appears. Select the predefined view you want to add. In Name, provide the name of the view. (Optional) In Label, define the name of the view as it will appear in the menu and on the landing page of the generated application. Click Add View to save the view properties and close the Add View dialog box. As a result, the module loads your new view with its defined properties and available options. In the module where the view resides, click the Settings menu of the view to open the drop-down options list. Select Edit to open the Edit View dialog box. In Edit View, update the properties you want. 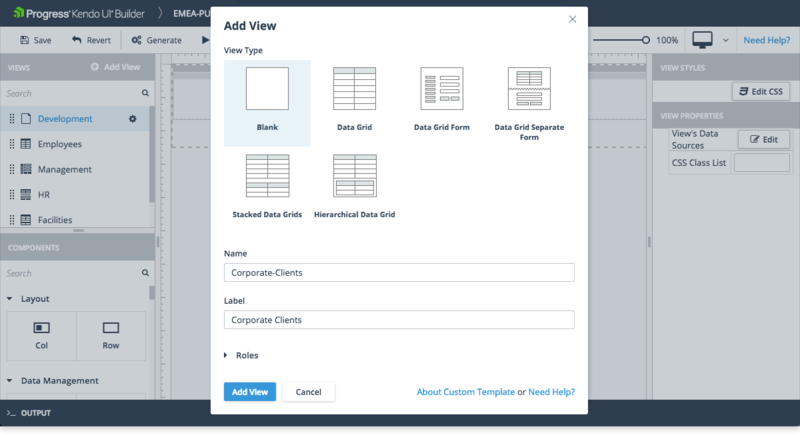 Select Duplicate to open the Duplicate View dialog box. In Duplicate View, update the properties you want. Select Move to open the Move View dialog box. In Move View, update the properties you want. Click Move View to save or Cancel to discard your changes. The order of the views on the module page corresponds to the order in which they will be rendered by the application at runtime. To reorder the views, drag and drop them within the module list. 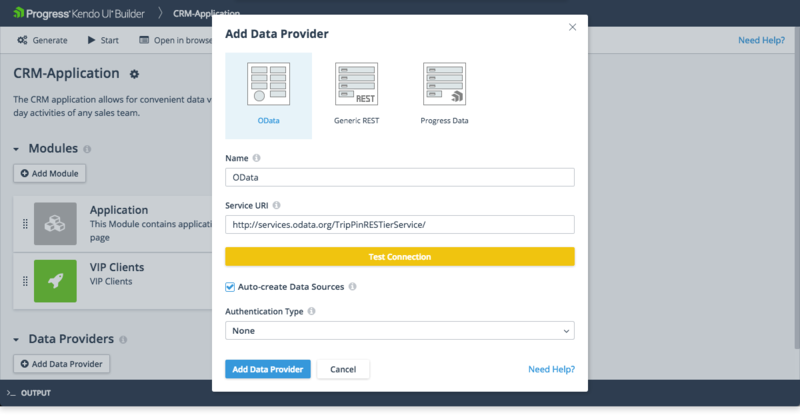 The Builder provides settings for adding, editing, and deleting the data providers. For more information on handling the supported data services and setting their data sources, refer to the articles on data providers. On the App Design page, click Add Data Provider. As a result, the Add Data Provider dialog box appears. Select the type of data provider. Fill in the respective the properties depending on the OData, Generic REST, or Progress Data provider you selected. Click Add Data Provider to save the data provider properties and close the Add Data Provider dialog box. As a result, the App Design page displays the card for your new data provider with the properties you defined. On the App Design page, go to the card of the data provider whose properties you want to update. Select Properties to open the Edit Data Provider dialog box. In Edit Data Provider, update the properties you want. On the App Design page, go to the card of the data provider you want to delete.